Its been another long stretch of deja vue in Atlantica as I tried to hone in and confirm the ground rules as it were for the coming winter. 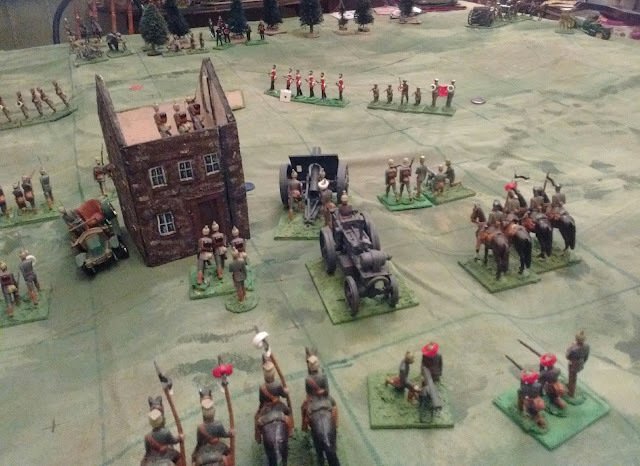 Quite apart from the rather important matter of trying to settle on a final version of the Square Brigadier after 5 years of exploration, and deciding on which period to focus on, there was the nagging but key question: "What's better, more units per game or bigger units?". This may seem like a simple matter but coming from a '70's POV, I am still adjusting emotionally to appearing to prefer a short game with a handful of small units to a long game on a large table full of miniatures. The middle ground is often the worst but the possibility needed conscious testing as did the selection of period. Four games and three versions of the rules were needed to reach some conclusions that can stand questioning. Third attempt: 1880's, 8 figure infantry units, one per scenario unit. This one isn't "it" either. The first go was for the 1850's, 12 figure battalions in closed ranks with muzzle loading firearms. This was the game featured 3 posts ago. That game was OK but not more. It certainly wasn't inspirational instead it felt a bit 'been there done that' and offered little or nothing over a War of 1812 game. I sat down wrote a new version of the rules, advanced the game to the 1870's using 8 figure battalions deployed as skirmishers and supports or lines or columns depending on how the figures were arranged. It was such a slog that I almost gave up on so afterwards I went back to re-re-read my May post on Command Control and realized that after reading it last week, I had gone ahead and managed to almost exactly replicate everything that the post indicated was wrong in May. (shakes head in bewilderment). I reset again going back to one of the oldest forms of the Square Brigadier: no command control just the initiative, chance cards and dice to bugger player's up, well plus their own choices. 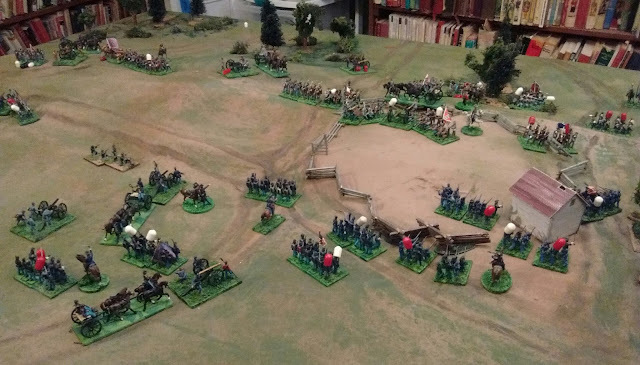 This time I used double the number of infantry units to reflect Grant's intro to Scenarios for Wargames in which he notes that infantry units should be twice the size of others so 4 "companies" grouped into battalions. It was better, but the table was too small for the number of units and was a packed traffic jam with reserves queuing up for their chance to fight and all sense of battalion integrity was lost as was the sense of skirmishers with supports. My reversion to an old option to move and shoot with penalties along with the well established but newer rear support meant that players didn't need to make many tough decisions. I reset again with the right number of units but with 4 man units, there were just too many figures left on the shelf. Well, my WW1 armies had recently been reorganized from 4 man companies to 6 man companies so I swapped out the armies again. There weren't enough in khaki so I subbed in some in Red and called it 1904 in Atlantica. The armies looked so small that I briefly thought about upping the hits per unit to prolong the game but stopped myself. Once again the small simple version without the various explicit support and pinning rules with fewer units on table was the winner. The game required my attention and constant, often tough, decisions all the way through, some gambles paid off, others didn't and the advantage swayed back and forth with Red coming soooooo close to winning, right up until Blue rallied 3 broken companies and then, thanks to a timely initiative flip, poured in such a hot rifle, mg and artillery fire that 3 Red companies broke and didn't rally, breaking Red's army morale somewhere around turn 13 of 15. Despite the small number of troops and simple situation, the game lasted nearly 2 hours and I didn't even notice. Damn! Got wrapped up in the game and forgot to take pictures till nearly at the end. The Oberhilse were "this" close to breaking but they rallied like fiends and hung on despite losing one side of the crucial pass. Faraway's troops on the other hand seemed impossible to rally. One theory is that the red coats made those units easy marks and they more of their hits were actual dead and wounded. Its just a theory though, could have been the dice. So much for rules. I need to bring the musket era rules back in to line but that decision is made so, same rules format and same small armies maxing out at about a reinforced Brigade. The periods were also clear. I still want a simple, historical, card table miniatures game that I could pull out as an introduction for an interested non-wargamer. The War of 1812 remains my choice for this so this fall/winter I will put the work in to use the existing figures to make the required number of units, paint up the handful of still missing Dragoons, artillerymen etc, flock the bases and generally polish it up as the long intended "game in a box". Since they are sufficiently close to ready and very compatible period-wise I will include a force of Brethren of the Coast privateers as allies (think Jean Lafitte) or as a force on their own. 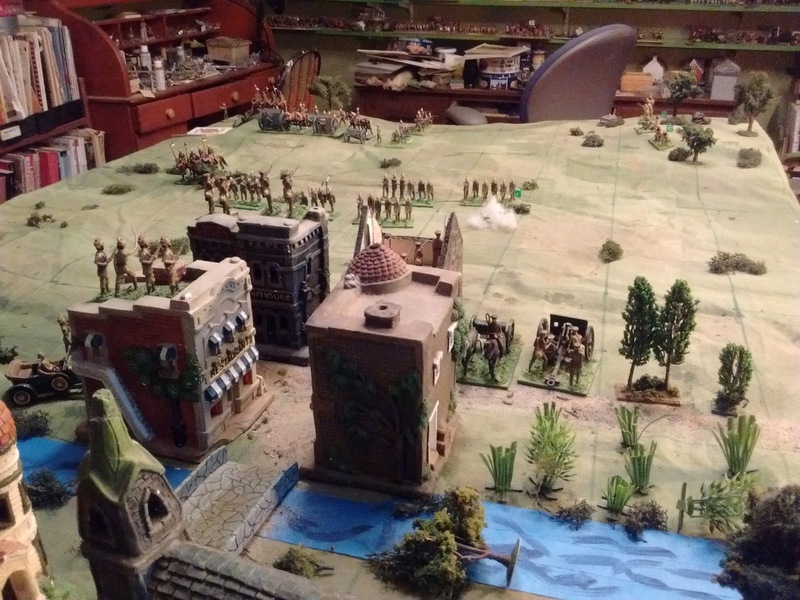 It is also clear to me that I still only have the resources (mental, physical etc) for one main 40mm collection if I am to run a campaign and I still have the yen, re-awoken in 2014, to do an early 20th Century Colonial campaign with railways and mounted rifles. Since my old Britain's are once again my Poster Boys for the "Little Wars look", the way is clear to proceed in shiny but drab 40mm. Since there are still some 40mm troops in early 20th Century red and blue uniforms, I will set the theoretical date early enough to allow the possibility of a few troops in home service dress. The sad but, for me, necessary part is that I am going to clear the shelves of all the fragments that don't fit with either of these options. This is partly to make room to properly display and easily access the armies that I will be using but also just to reduce temptation and distraction. I don't intend to melt down or sell any of them yet (though I might if asked) , just put them out of sight until the Great Little War is built and fought out or until it goes on long enough to extinguish the desire to revisit old, abandoned business. However, before all, October is "MacDuff Prepares for Fall In" month! When I am as ready as possible for the Quebec 1759 and Detroit scenarios that Rob and I will be running, I can play whatever I want again. Just been one of those weeks. I did make it in to Halifax for a game with 4 longtime friends. Lentelus' 10mm WWII Russian Front. The scenario was CS Grant's Bridgehead breakout. The game itself was a good example of one way BKC can go off the rails. I was the Russian Armoured commander. On turn 1&2 I watched 1/2 my tanks get shot apart by a pair of Stugs. Then Rob's naval FOO rolled low and brought in 3 'batteries' of heavy naval artillery from an offshore Soviet Battleship. The Germans had a heavy concentration of tanks, infantry and HQ off to the side of and behind the Stugs. The first barrage wandered just enough to take most of it in and shook things up a little but it didn't stop there. Rob's FOO rolled even lower and then topped it off with snake eyes after that. By the time 4 barrages had finished wandering back and forth with 12 dice per barrage per target, there was almost nothing left and the game was over. Luckily it was still a great afternoon and evening with friends. Hopefully tomorrow I will wrap up September's Atlantica and the Square Brigadier struggle and resolution. Here we are back in 1890somethingish ready to open up with the 4.7" on a slightly different enemy.. Felt too crappy again today to do anything physical but I did review the successful July 1812 mini-game, reread my spring thoughts on game design and think back on the August 54mm games and reread my current rules intro about many things assumed to be controlled by subordinates and thus not presented for the player to make decisions on. Then I sat down and worked on consistent Square Brigadier variants for the 2 periods: an early, close order, musket period game and a later breechloader/magazine rifle, open order variant. Here are links to the refurbished rules. The Defended Border (aka The Square Brigadier in the War of 1812.) This will be quite a small collection designed as a portable game suitable to be hauled out to the yard to play on the picnic table or as fodder for a One Hour Wargame. To that end each side will have a choice of a maximum of 12 units. 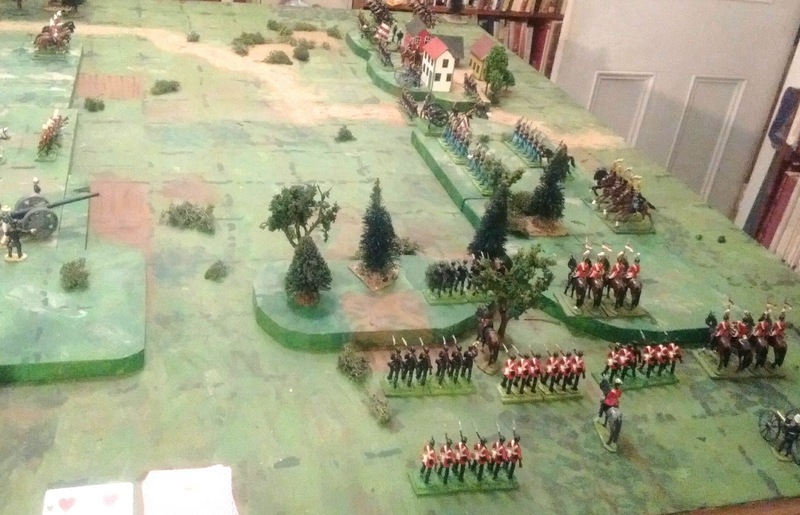 For now I will leave a few of the British 1837 figures but the goal is to replace them with proper 1812 ones. The Tin Army in the Great Little War. (aka The Square Brigadier in the Age of Rifles). I will use these for the Atlantican Little Wars Red vs Blue games, the Oerberg Colonial games, the early Great War and the 54mm Northwest games. I will rely on different force and weapons composition and different terrain and scenarios to give each of the sub collections a reason to exist since they already do. ( The real reason just being that I wanted to paint them at the time) Not all the needed unit and weapon types are dealt with yet. 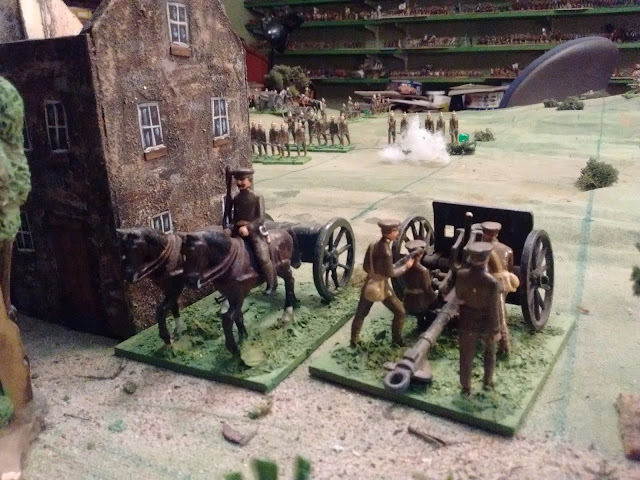 The 1860's in 40mm have been cancelled once again and existing units for the period brought forward to the 1890's or pushed back to the 1830's/40's.. I'm somewhat annoyed that, from my habit of studying the Fenian Raids, I did my new Canadian figures in Fenian Raid style forage caps instead of Riel Rebellion Glengarries or Boer War slouch hats as originally envisaged but they'll wear almost anything in Atlantica in the 1890's and who knows, I might do a mini Fenian Raid game-in-a-box yet. The game reset with 4 figure companies of infantry in open order. 3 to 4 companies + a Commander to a Battalion. The biggest change is that I am going to give up my combined initiative/chance/turn counter card deck and go back to rolling for orders. It does seem to make for a more engaging, challenging "game" and gives at least as "realistic" game without the need to fall back on chance cards and artificial mechanisms to freeze some units. I have also decided to ditch the various rules for reducing or recovering hits for an increased capacity for taking them. This is partly because they don't often have the sort of tactical effect I was hoping for, partly because I'm less sure what I was trying for is as right as I thought and partly because they would have been one of those subordinates' concerns anyway. Game report to follow once the game has been played. Sorting a Century and other housekeeping. Ever since my spontaneous excursion into the Great War in 2014, a diversion from Plan made worse by my renewed determination to keep my 54's alive and active, I've been in a muddle over what to do about the excessive number of collections covering the century from 1814 to 1914. We aren't talking about large numbers of figures but it was a final straw effect. Too many figures for my shelves and cupboards, too much for my head, too many choices to allow me to get into a proper mini-campaign or to finish anything. All of this made worse since there was considerable overlap. I've done much thinking and some test games over the last year, including yesterday's game. I've re-purposed some troops, and I've re-homed two collections of 40mm troops and enough 54mm Arabs to disperse any thoughts of going back there. At last, I now have a new plan. Hunh? What happened to the 4.7"? 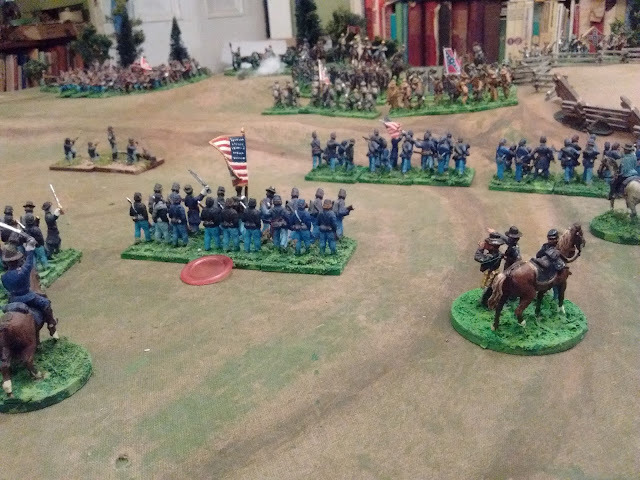 Well I decided to try an impromptu 1860's version of the 1812 version of the Square Brigadier with 12 man battalions and so reset the table accordingly. Here's how my extended 19thC looks now. 1. The War of 1812 in shiny 40mm. This is aimed squarely at small, one hour-ish Square Brigadier games with small battalions or detachments as units. The goal is to be able to fight the main battles in Upper and Lower Canada. 2. Atlantica in Shiny 40mm. This will eventually be the long delayed mid 19thC Colonial campaign against the northern native Atlantican state and its army. This will have "company" sized units which by themselves represent a detachment or skirmishers but up to four of which may be combined into a close order battalion. I've tried to avoid this as it is Gridded anathema but I can't find an acceptable way around the need for this sort of flexibility for this sort of campaign. 3. The American Civil War in 1/72nd. This is a battle game. At the moment units are 3 stand regiments but I might consider going to 5 stand brigades as units, maybe, probably not though. 4. The Northwest Incident in shiny 54mm. This is aimed at small fictional battles with company sized units in the age of breech loading rifles using a variant of the Square Brigadier aka the Tin Army. 5. The Great Atlantican War in shiny 40mm khaki. This is the sideshow which keeps threatening to become my main thing every time I touch it. It is set in the early years of the 20th Century and includes both conventional warfare between the Great(ish) Powers and Colonial games. It will use the same rules as the earlier Atlantica and the 54mm game with company sized units but with magazine rifles and machine guns. Here's the game about 1/3 of the way through. It worked and kept me entertained and thinking for about 1.5 hours but... something was missing. It was interesting but not exciting, too incremental, reactive and artificial perhaps. I'm not sure, might have just been me. Command control and detail again. For some time now I have been flip flopping between two mechanisms to make it harder for players to always have every unit moving as and when desired. Both work, both have downsides. This game was played using the "dice for unit's outside command radius" method. It works OK when I remember to apply it. At the moment it doesn't really emphasize the importance of maintaining multi unit formations though. I had hoped that the combat rules would be sufficient to encourage that and they mostly do, but not as well as the Order PIP system does. In some recent games I started each turn with a "place out of command chits" phase and that have helped me remember the rule at least. A smaller command radius for subordinate commanders might encourage tighter brigade formations. I'm also still trying to put my finger on an illusive "something" with these Division sized battles. The command rules feel a bit too immediate, like an active brigadier controlling his direct reports rather than a Division Commander controlling his Brigades. Short of written game orders or a team of players, I always find this hard to do simply, especially when playing solo. A Brigade posture rule perhaps with a delay in implementation of new orders? or maybe a change to command radius to only allow a Brigadier to control a group of contiguous units. No serious thought on this yet, just an observation. I don't have a similar issue with the 'company as unit' games since the over all commander can be very hands on in life in such situations. Maybe its just that I'm tired of only having one hour type games but can't seem to get any game to last much longer on the small table top? Turn 15. Victory is decided by control of the pass. Red had been on the verge of taking one side of it before Blue's last line threw Red back. They've rallied but there was no time for another attack. 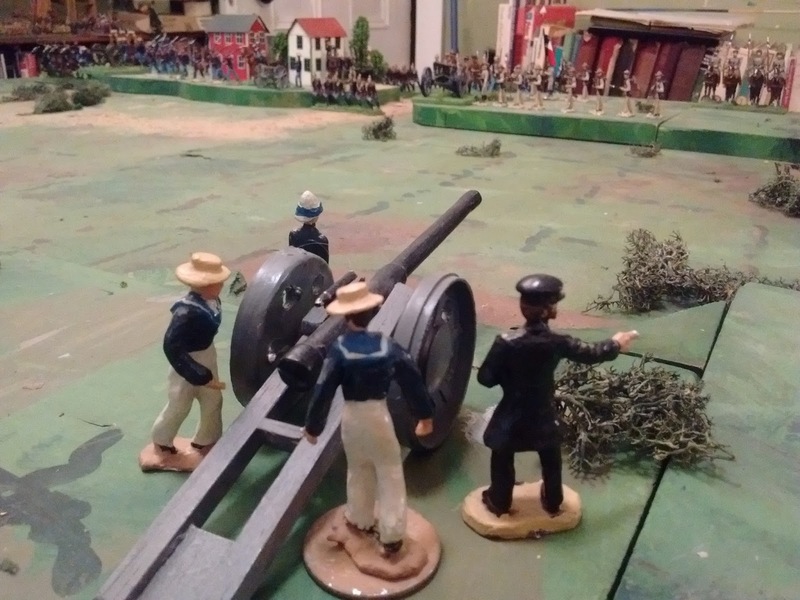 There was just time for a last salvo by the heavy naval gun into the teetering Blue Guard. They broke. Blue had to rally either the Blue Guard or the Dragoons who had broken on their last turn in an ill advised attempt to over run the gun frontally. Neither rallied and the Blue General, now below 50% units still on table, was forced to concede and retire from the field. One of the things that has been nattering at me over the last week or so is the question of "How many units?" and its supplementary questions "In that case what's the minimum table size and number of squares?" and "In that case what do the units represent and is the wargame a battle or a skirmish?". The Naval gunners train the 4.7" while waiting for the Armies to decided how much infantry they need. The answer was easy in the days when I used twenty four man units on a plain 6'x8' table but along came Bob Cordery and Richard Borg and recently my table has often been covered by four man units on a grid and sometimes I just lose my bearings. 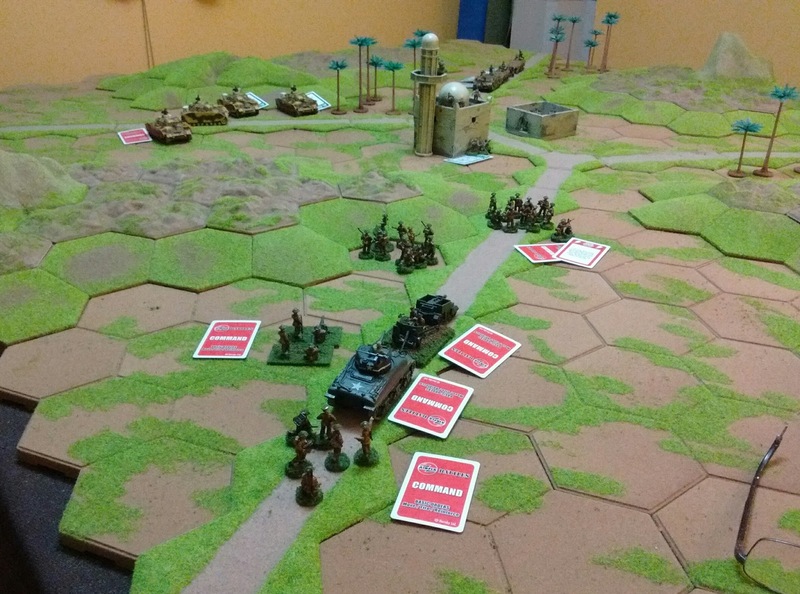 The scenario laid out at 1 Square Brigadier unit per scenario unit. So I chose the scenario suggested by the Grand Duke of Stollen and started by laying out the troops unit for unit. That looked kinda sparse so I upped the infantry by 50%, that was better but 1.5 is an awkward force multiplier if you can't represent a half unit so I doubled it. 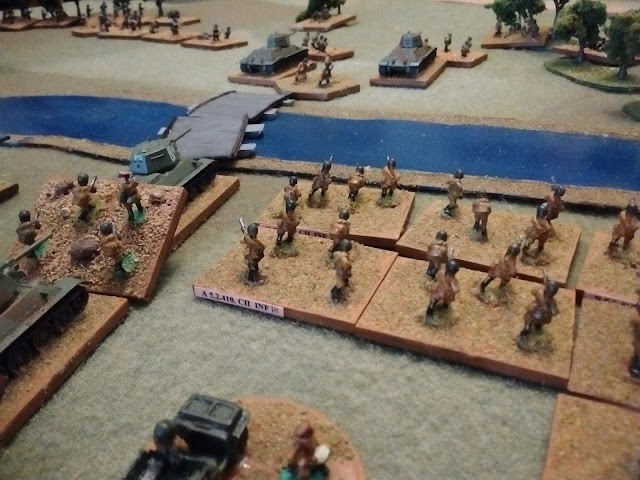 Now we were talking, the table started to look a bit crowded with fourteen Oberhilse infantry units. Fourteen? Fourteen what? Companies? Battalions? Half-Battalions? It was not only crowded though, in places the troops were spilling over their specified deployment areas. I could fix that though by extending the table by a foot. .....Right. Did I really want to do that though? Then I thought about last Wednesday's game at Ron's. 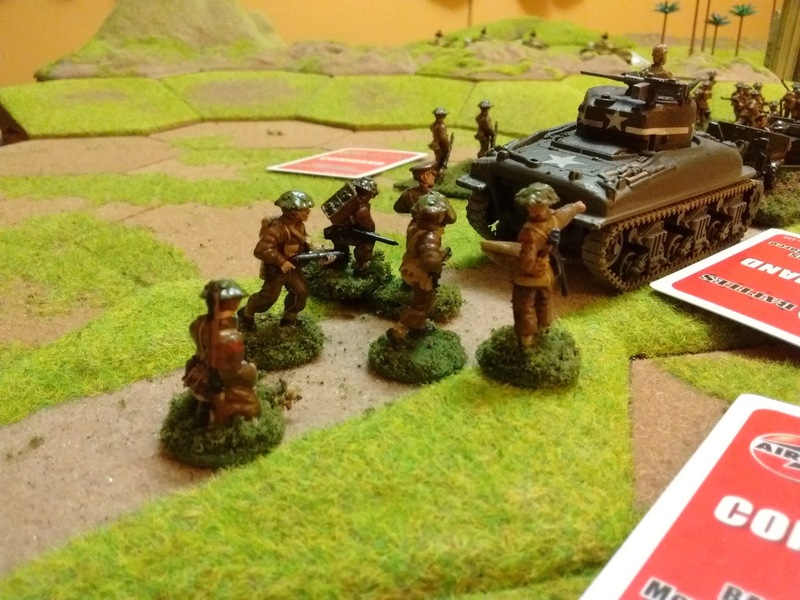 Airfix Battles, 1/72nd WWII Canadians vs Germans at a Sicilian Crossroad. One unit per scenario unit plus overall points balanced in proportion to make very different opposing forces. When Ron suggested one unit per scenario unit I was dubious but he was right. It was a tense game of the satisfying type which played through a series of shifts of advantage to a draw after two full rotations of the deck and over three hours of immersed playing. I reset the table to one unit per unit as shown above. My 1900 and 1914 armies may be staying separate after all and both may be closer to finished as separate armies than I thought. "Right, you guys have your orders, get on with it!" Game to be played Monday or Tuesday if all goes well. That is to say I have a bunch of thoughts lurking in my brain but haven't had the time and energy to hunt them all down and explore them and I'm way too tired for a long post tonight anyway. However, I did manage to throw out another OHW scenario yesterday and played it out today in a couple of 10 minute sessions in between various duties. This was the Lobositz inspired scenario played out on the 5" grid thrown over the hills. I added a few more minor terrain features to suit myself and doubled the number of units as usual for me. This led to 2 companies of Baluchs holding the Lobosch feature while 3 companies of British and Indian infantry held the town supported by a battery, a squadron of lancers and an armoured car disguised as a light tank. The Germans attacked with 8 companies of infantry, 2 guns and 2 squadrons of cavalry. The game ran for 12 out of 15 turns using an early 20thC variant of the Square Brigadier. Atlantica during the Great War. Thank Gawd for the guns! The main point of the game, apart from hopefully distracting me from things when I had time for a break and enough energy to play, was to try out the Square Brigadier on a smaller number of larger squares. The main advantage of the larger squares is that terrain and models fit better and I quite liked them last year when I experimented. Somehow the wider, more linear frontage helps clarify the movement and combat rules on an instinctive visual rather than an intellectual basis. The drawback as I found out then was that I obviously have fewer squares on table and thus less room to manoeuvre and less space for troops. To be more precise the cloth is 9x12 5" squares vs 12x15 4" squares painted on the table or the 10x12 3" squares of my portable board. An overview mid game. An initial attack on the hill in the far right corner has been repulsed. It seems to work OK with the One Hour Wargames but while they can be an enjoyable diversion when time and energy are short, they don't fully satisfy me, there just isn't enough to them. An appetizer rather than a main course. I'm not sure when I will have time but I need to try a full length Grant Scenario with as many units as I can jam into this grid. If that works then I can leave off attempting a better planned set of hills with square corners and sized to one grid and just use the cloth over top with a non-gridded cloth for other games. If it doesn't well, I'll have more thinking to do. Turn 12. The Germans have been repulsed again from the hill and have resorted to a bombardment while in the town each side holds 1/2. Both "armies" were 1 unit away from morale failure and the dismounted Uhlans battling Baluchs in the streets broke first initiating an order to break off the attack. If it had been a fight to the last man I doubt that 3 turns would have been enough for the artillery to finish clearing the hill or the battered German units to take the other half of the town but it was at least conceivable given lots of luck. In the meantime, I'm off to Halifax in the morning for more Airfix Battles on hexes, Scenario 2 from Scenarios for Wargames. There are times when I suspect my subconscious of only wanting to play with half ready armies. So when I found myself thinking it was time I played something that had something to do with my Gathering of Hosts blog, I also found myself looking at cobbling together a Turanian force from vague ideas and promising recruits. 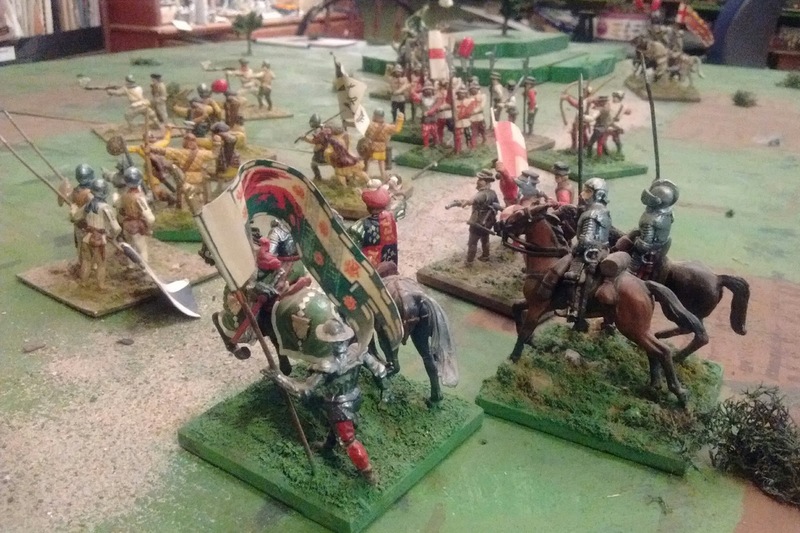 I put my metaphorical foot down and decided to test the game with my 16thC Anglo Scots armies. They actually belong to this blog, not that one, but the rules bits about reverting to rolling dice to determine how many inches a unit can move can go there. The scenario was Thomas's 30 minute Salamanca. I think it might have been better with different armies and different rules and hope to prove that tomorrow. Basically the English have to get half their units off the far edge of the board by road. Why by road? I dunno but since I had spare acreage outside the playing zone, I added an impassible river off table with a bridge where the road crosses, so that's why. Scots: 6 stands of pike with General blocking the road. 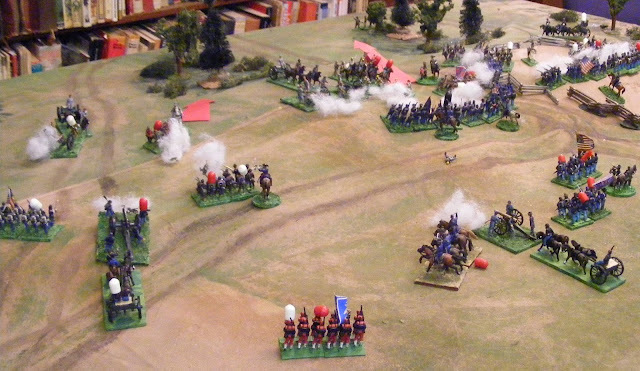 6 stands of Highlanders, 3 of skirmishers and 3 of border horse making a flank attack. English: Left, 4 Bills, 2 Bows, Center: 4 Bills, 2 Bows, Cavalry: 3 demilances including General, Rearguard: 3 Border horse. 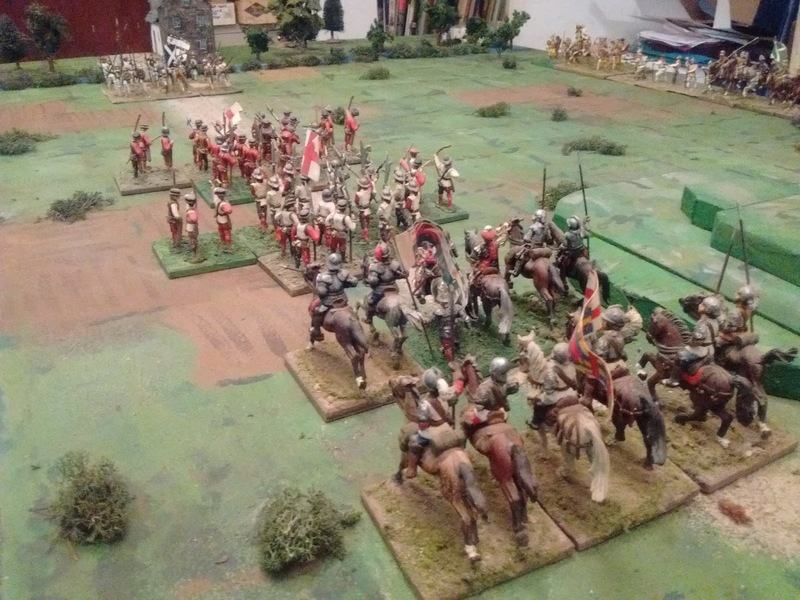 There wasn't much room for manoeuvre so there was a bit of shooting then a big brawl with the Demilances coming in on the flank and the Border Horse making a show of fighting each other until on turn 5 of 15 the Scots morale broke. The English had 1 stand over 1/2 left so were able to saunter off the table in the following 10 turns. Quick and bloody. Now, the real point of all this is that after a lengthy trial, I'm having second thoughts about using a grid for so many of my games. There are some minor quibbles about the interface of front and flank along the diagonal with squares, especially when long range weapons come in, but the real problem is the amount of custom terrain that still needs to be made and that having backslid to using 3 sizes of figures and various scales of game, I could really use a variety of grid sizes and thus terrain in different grid sizes. It is possible to just make what fits in a grid area a "unit" and keep using the same grid size and mostly shared terrain for all games is starting to make different periods and campaigns feel too similar despite small rules changes. In addition, the return of 54's is stressing my ability to share terrain and fit it to the grid. At the very least I need more custom terrain possibly including some multi-grid area terrain pieces and rules for the same. At the moment I have the grid painted on and sometimes throw an old battered cloth over it for non-gridded games. The Scots depart. The way ahead is open for the Earl's remaining forces, just enough of them. No decision yet. At the very least I need a new cloth, but I'm contemplating over-painting the grid and using a choice of gridded game-mats thrown over top when I want the grid instead. Game 2 Battle is joined. My 1/72nd ACW lads have 2 distinct special places in my collection. First is the obvious nostalgia angle shared by many gamers of "a certain age". The second is that it is just about the only (no offence or denigration intended) "real" (sic) historical wargame left in my arsenal at the moment. By that I am partly referring to a certain degree of attention to scale and style of rules but mostly it's about the ability to refight actual historical battles in a non-abstract fashion. 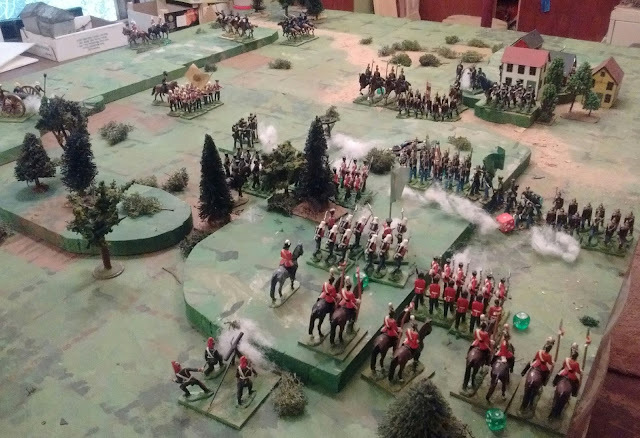 My remaining 1812 forces are close despite the choice of later style hats but there aren't enough left at the moment for anything but a very abstract game and that with borrowed troops. Now there are some good reasons for this, I really enjoy quick, "game" heavy, fairly abstract, wargames. Quick to set up, engaging, perhaps even exciting on occasion, to play, quick to put away. Every now and then, however, its good to have a wargame that takes hours to research, plan and set up, and hours to play. Obviously the same figures can be used for both if they start as traditional wargame armies but I am determined to justify my reduced selection of scales and periods. 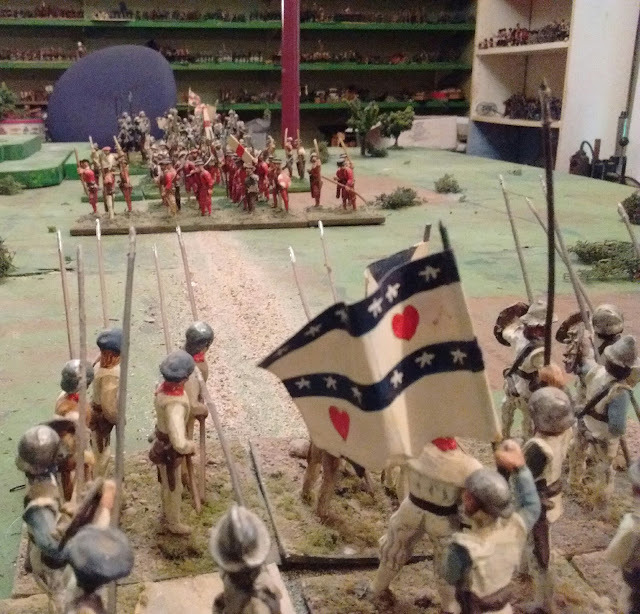 Since these once big 20mm fellows are now my smallest figures, and are supported by very accessible research material, especially of my favourite eye witness kind, and fought over terrain that is familiar to me, they will carry the "historical" wargame banner for me. This weekend's game was an impromptu affair designed by throwing an old cloth over the not yet cleared away bones of the last game and imagining what might be happening. It was probably inevitable that it would again be a clash between opposing Advance Guard divisions over controlling the high ground. 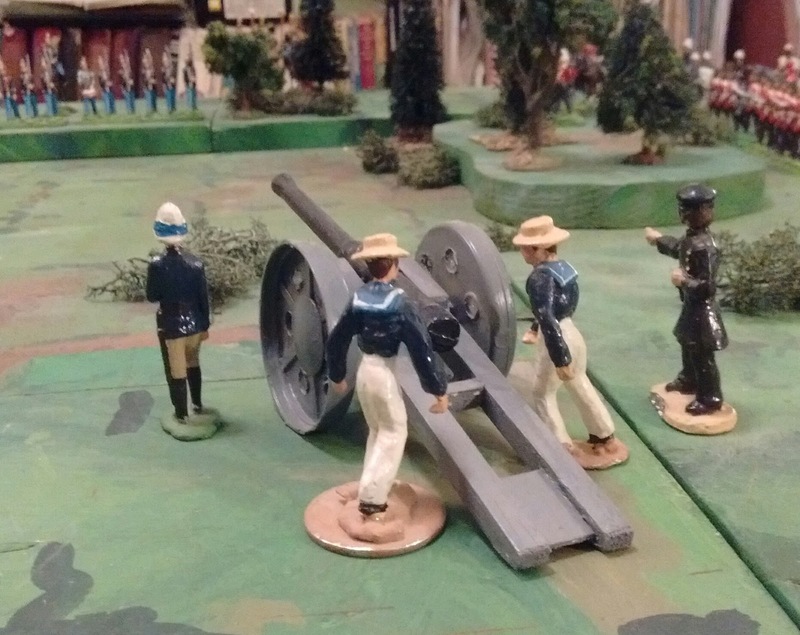 In each game, brigades rolled for time and place of entry making each game different. I don't want to rebase my ACW armies or go to the "each 3 stand unit is a Brigade" level that I used for the 2014 Gettysburg game (click) or the 2013 Picket's Charge game (click) but cutting my units to 2 stands would allow me to easily fit a corps on my extended table so I tried it out. The rules were basically the ones used for last spring's ACW game in the pass clearance scenario. It worked ok but.........just didn't feel right and I realized that I don't want to paint up more flags or fiddle with the existing regiments, some of which have seen enough action now to make a name for themselves and be instantly recognizable. It also took 3 hours again for a medium size engagement and had the worse sin of getting tedious in parts. Too much rolling, not enough decision making. Game 2. General Kinch was there Fustest with the Mostest but his attack was split and it stalled as Yankee numbers continued to grow. On Sunday I reset and tried again using an alternate set of more OSW rules with a heavy dose of Featherstone but not his combat system since I have enough trouble tracking casualties as it is. Again it was "OK but". This time, I couldn't quite put my finger on the problem, it just somehow didn't feel "right" and once again it had too few decision points and the combat system wasn't "exciting" enough, no holding your breath on a big roll. 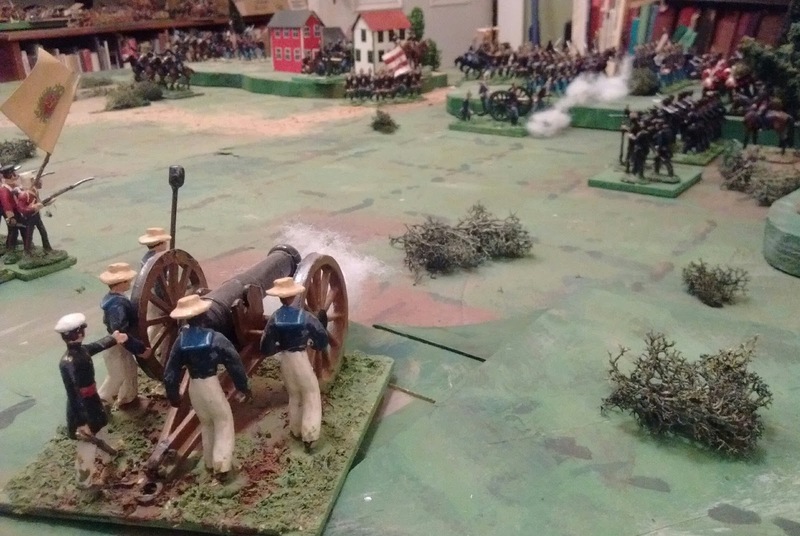 The battle was closing to a draw when suddenly it wasn't as the Confederate forces gave way. BTW the top two pictures were taken using my smartphone, easy-peasey but never sharp, the bottom two were taken with my camera which is a pain in the ahem to use, tripod too big without being tall enough, no direct upload. Are the camera pictures any better? Seems to me that sometimes they are but usually they're not. (operator!) Are they worth the effort? Please leave a comment if you have an opinion on the matter. Finally. 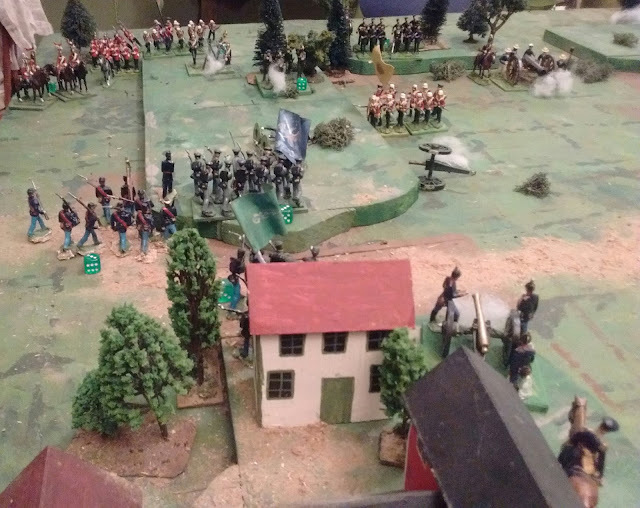 yesterday evening, after much thought, I went back to a simpler set based loosely on my earliest Morschauser inspired rules which are behind Hearts of Tin, The Square Brigadier and the Plastic Army of the Potomac, but less "game" oriented. That worked better and was more fun but was if anything too quick. Just needs some fine tuning and it should be my way forward for a full afternoon Corps game. I just need to out the effort into some better terrain and a quieter way to record hits. The pipe cleaners almost worked but they're too fat and tended to stick together. Maybe painted toothpicks or a different brand. Removing stands felt right too. It reduces frontages too quickly but gives that 'pit of the stomach' feeling as you strip away stands from a favourite unit or try to figure out how to plug the growing gaps, the emotional bit. Next up Gorham's Skinny Rangers. A slight detour before I get on with the 40mm tricorne stuff. I'm satisfied that I can have an enjoyable, small, quick, simple skirmish/company level action on my table and I like sharing common systems across wargames to ease the strain on my brain and mid game confusion but........I also want to maintain the ability to play a good ol' fashioned division or corps level, battalions as units, rulers and dice, 3 hour long wargame. Airfix & ACW, my kind of traditional. This is why I've been hanging on to Hearts of Tin and why I've gotten hung up every time I try to harmonize it. Got it again! Hearts of Tin is for this stuff.